Sakab Designs is an Owner’s Representative firm that provides real estate construction and comprehensive project management services to Clients undertaking facility renovations and new construction projects. Sakab Designs understands the issues faced by Owners and appreciates how disruptive construction and moves are to a owner trying to fulfill its mission. Sakab Designs views the client’s needs and integrates them into the planning process. We have the industry knowledge to find appropriate professionals, confirm that their bids are inclusive of all costs and thus that change orders will be minimized. We have saved our clients time, money and resources with our experience and flexibility of use. In General – the Owner’s Representative shall be a seasoned construction professional with experience in similar projects, who shall perform, subject to the direction and decisions of the Owner, the role of Owner’s Representative as generally described in the scope of work. 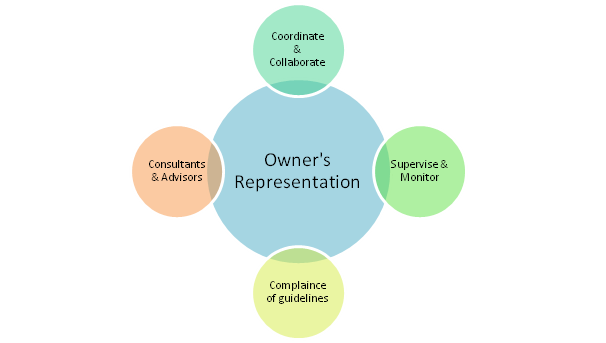 The Owner’s Representative will be an agent of the Owner and shall owe duties of care and loyalty to the Owner. Demands on the individual’s time and energy will vary with the progress and stage of the projects progression.